This year has proved to be a cropping cornucopia, at least in my part of the world. And if there's one family of crops that's guaranteed to give a truly glut-busting performance it's the many berries, currants and tree fruits that make up our edible Elysium. We're often invited to conserve this bounty by donning the pinny and getting busy chopping, cooking and conserving our way to the larder. Jams, chutneys, curds and the like, combined with freezing, offer an excellent way of preserving a little of this plenty for later on in the year. But there is another way: drying. Fruits are composed of up to 95 per cent water. Drying fruits reduces this water content by around two-thirds, effectively disarming those nasty microbes that would otherwise spoil our hard-won fruits. Drying, or dehydrating, is a simple, age-old process that can be carried out at low temperatures and very economically. It preserves much of the original flavour and nutrient content of fruits and will turn them into snack-time treats with a healthy twist – just think chewy apple crisps or luxurious fruit leathers! Readers basking in a warm climate can use the natural moisture-wicking power of the sun to dehydrate fruit. For the majority of us, however, changeable weather and cooler temperatures will necessitate drying indoors using artificial heat. This can take the form of racks propped on top of range cookers, ovens set at the lowest-possible temperature or electric dehydrators. 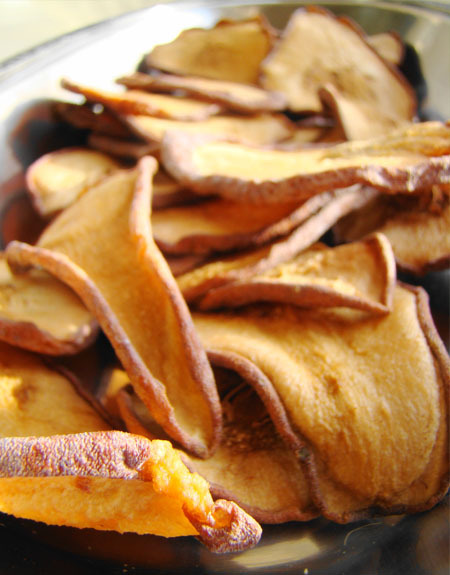 Electric dehydrators offer the most consistent results. Most can be set to a specific temperature and as they are generally small units they won't cost a fortune to run. The big advantage of dehydrators is that fruit may be dried at a low enough temperature to retain the full nutritional value of the fruits. This may take more time but you'll be able to enjoy the full goodness of your fruits, something you wouldn't be able to do if you'd cooked and canned your haul. My dehydrator is a top-of-the-range Excalibur model that's widely recognised as the heavyweight of the dehydrating world. You can spend between US$250 and US$500 depending on the number of trays you want. Please don't panic at this seemingly eye-watering investment – you can pick up a basic dehydrator for ten times less than this! While drying can preserve flavour and nutrients, it won't necessarily preserve colour. To avoid discolouration of fruits such as apples and pears they must first be soaked in a mildly acidic solution, which has the secondary benefit of killing off bacteria and softening tougher skins of fruits such as grapes. Citric acid is a harmless and convenient concentrate that's dissolved in water to create the mild solution you are after. You could also use equal parts water and lemon juice, though you'd need quite a lot of lemons if you're hoping to dry a sizeable batch of fruit. After soaking the fruits for 10 to 30 minutes they can then be placed into the dehydrator. Temperatures up to 57°C (135°F) will see speedy results, but to conserve maximum nutritional value don't go warmer than 40°C (105°F). You'll know your fruit's ready when it's pliable and exudes no liquid if squeezed between thumb and finger. Test fruit only after it's been allowed to cool back down to room temperature. If you're not going to eat your dried fruits within the next few weeks sterilise it by packing into boxes and freezing for two days. Defrost on a clean baking tray or tea towel/dish cloth then store in an airtight container where your fruit should keep for up to a year. Most berries can be dried whole, with larger strawberries cut up into halves or quarters. Plums, apricots and nectarines need to be de-stoned then halved or quartered, while apples and pears should be cut up into slices 5-10mm (0.25in) thick. Fruits with skins should be dried skin side down. Apple and pear rings can also be dried by threading the slices onto twine suspended over a heat source such as a radiator. Leave a gap between each slice to stop them sticking to each other as they dry up and curl. Satisfyingly chewy fruit leathers are delicious, easy to make and full of nutritious energy. Simply pour fruit pulp onto a non-stick sheet and allow to dry at a temperature of around 57°C (135°F). Again, a dehydrator will prove invaluable for making leathers by ensuring consistency. Leathers will enable you to get creative, pairing fruits that are a natural fit – how about strawberries and rhubarb or apple and raspberry, for example? You can even add spices to boost flavour further. Popular additions include nutmeg, or cinnamon or ginger for gentle background heat. Leathers should have the touch and feel of their namesake: smooth and supple's what we're after. Tart fruits will need a sweetener added (sugar, honey or very ripe bananas) but most can be turned into leather as is. Blend or mash ripe or over-ripe fruits into a puree having first washed then chopped to remove any blemishes, pips and peel. Pour the puree onto non-stick sheets to around 3-5mm (0.25-0.5in) thick. The edges will dry out quicker than the middle, so make these slightly thicker than the centre. Drying times vary at between four and eight hours. You'll know your leather is ready when it isn't sticky to touch and has a slight shine to it. After it has cooled, carefully peel it free and roll it up into cigars for storage. Keep in airtight jars or wrap in sheaths of cling film/plastic wrap. Dusting leathers in icing/powdered sugar will prevent them sticking to each other. Drying's certainly a fun and convenient way of storing fruit, including the likes of vegetable fruits such as sliced tomatoes and whole chillies. The secret lies in exploring what works best for you and building on this repertoire. The taste, I can assure you, is anything but dry and bland! "Thank you, very helpful information for my new 2014 adventure, I will keep you informed how it is going... "